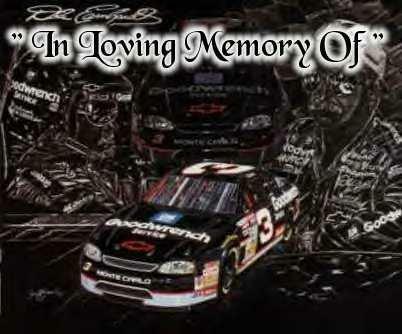 We cheered you, we love you, we will always miss you Dale! And forget about my troubles for a while. Bad news at the racetrack,about the Man in Black. 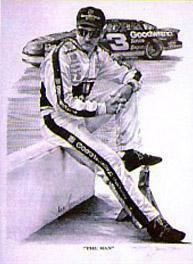 The day that Earnhardt Died. We’ve lost a friend that’s a fact; we’ve lost a friend that’s a fact. And how to take the checkered flag. And would return next week to do it all again. And had a certain style. 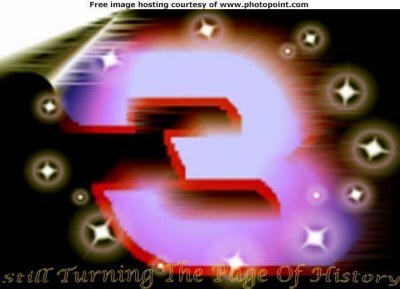 And we would no more see the#3. He hadn’t made it through. And asked the Lord "Oh please"
But one day he went away. But he wouldn’t race that day. Their hearts were all broken. And Dale is in the lead. and praying to the skies. each time "Gentlemen, start your engines" is said. Dale will always be there. and Earnhardt on the pole. He gave his life doing what he loved . He will always be remembered. and now with this tragedy, all we have is our tears. But in all of our hearts, you held a big spot. 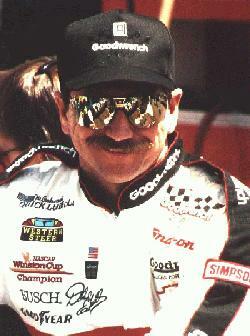 You were the Intimidator, The "Man in Black"
You raced your heart out, you could tear up a track. But in our hearts you will race forever!